It’s time for the special 200th episode of The Weekly Stuff Podcast with Jonathan Lack & Sean Chapman, a weekly audio show that explores the worlds of film, television, and video games. You can subscribe for free in iTunes by following this link. For our milestone 200th episode, we revisit the podcast’s very first topic and take a look forward to the future of the show. With 200 episodes in our rearview mirror, we have decided to expand, and as we explain on the show, this week we are launching a Patreon page – www.patreon.com/weeklystuffpodcast - where listeners can help us make the show bigger and better than ever before, as we expand to producing bonus episodes, Let’s Play gaming videos, and much more! We are so excited to announce this expansion of The Weekly Stuff brand, and we hope you’ll join us for the ride! 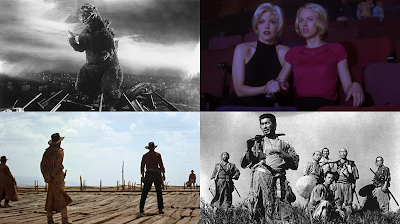 And for our main topic on this 200th episode, we present a new version of our respective Top 10 Favorite Films of All Time list, which we first presented on Episode #1 of the show. Now, five years later, we are older and wiser and altogether quite different, so how have our lists changed? What do our favorite films say about us? And just how many Japanese films can Sean and Jonathan talk about in one episode? All this and more in one of our favorite podcasts we’ve ever recorded. Thanks for helping us make the first 200 such a blast – and here’s to the next 200.